You are currently browsing the tag archive for the ‘batman’ tag. 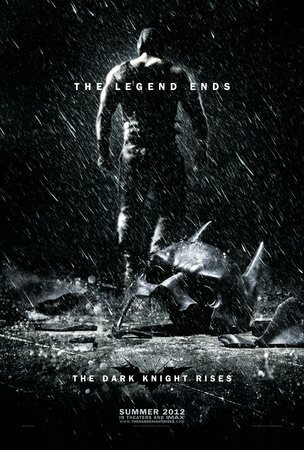 I just got back from watching The Dark Knight Rises and was quite happy with it. For a film close to three hours, it didn’t feel tedious or boring (as much as it should have) and was quite exciting throughout. I don’t intend this post to say anything other than the fact that it was an enjoyable watch, and the fact that it wasn’t as good as The Dark Knight, unfortunately. This is going to categorised under English because I’ll mention a few English related writing and film techniques. There will be no spoilers, I’ll keep this very general so as not to ruin anything. I will hint at things though so, if that bugs you, watch the movie first. I glimpsed an interesting article a few days ago about this movie being a political message. I disagree, and think this is just another case of people reading too deeply into things to try and sound intelligent. While it is true that the creator of any story will inevitably let their personal ideologies seep into their text, I strongly doubt the movie was meant as a political message. However, I do think there was a strong intent to ground the film in reality – a quick look into the story’s plot devices will find several modern day concerns, such as identity theft, corruption, the income gap, returning power to the people (and taking it away from the wealthy), terrorism, government decisions, “structures as shackles” (you’ll understand this after watching the movie), and even the dangers of nuclear-related energy sources (which, despite the recent Japan scare, is stupid to anybody who knows anything about science – candles have killed more people than nuclear reactors, and nuclear power is the greenest power available to us right now; but that’s another rant). This isn’t a bad thing that Nolan’s done. His film was intended to be very gritty and realist in the first place, and as a writer, I know that grounding things in reality is a fast and effective way to build a connection with your audience. For a movie that was trying to say so much, it needed a fast way for us to care. Unfortunately, it missed a bit in that department. With the introduction of Catwoman, Bane, Ra’s al Ghul’s child, Robin (you’ll find out who he is at the end), and a whole list of other characters with more minor roles, as well as the reinvention of Batman himself, it was very difficult to make a strong connection to the characters. When comparing this to The Dark Knight, we can see a huge contrast. Those of us who are writers will identify two broad categories of stories: character driven and plot driven. A character driven story depends hugely on the audience’s attachment to the characters, whereas a plot driven story relies on the twists and turns of its plot. These are by no means mutually exclusive, but it is almost always possible to identify which of the two a story most strongly identifies with. The Dark Knight was a film that was stolen by the villain (refer to my post on Villains), the Joker, and in Heath Ledger’s absence we can truly see how much of that story was driven by his amazingly played character. By contrast, The Dark Knight Rises is very plot driven. It feels as if we’re watching a series of exciting events unfurl, but there’s no connection to the characters (at least not as strongly as when the Joker was present). Batman’s character was the strongest emotional connections for the audience, with the fall and rise (hence the title) of his mental state, as well as the rise and immortalisation of the symbol of Batman, but compared to the complex love-hate relationship the audience had with the Joker, it feels weak. The cinematics and mise-en-scenes were done very well, if a bit cheesy (torn US flag wafting in the breeze), and the visual effects really added to the excitement of the story. I’m willing to bet that watching it in the cinemas will be a completely different experience to watching it at home. The little plot twist at the end feels a bit too sudden for my liking. They chose a good character to play the child, but as somebody who likes throwing in twists, I still think the audience deserves a bit more of a hint lest the twist feel too much like a deus ex machina (a cheap twist thrown in to “spruce things up”). There was no warning for the betrayal, it just happened. Also, the ending [b]did[/b] feel a little too nice (again, deus ex machina when that dude didn’t die – that’s all I can say without ruining it), but considering how things progressed, the chaos that occurred and the rise of Batman as an undying symbol to which future heroes would flock and take up the mantle when needed, it didn’t feel too bad. I guess I didn’t want him to die either. Anyway, it’s hard to say more without giving away things so I’ll leave it at that. My advice is not to get too excited about the movie. Don’t expect an incredibly feat of awesomeness that would shoot rainbows through the last movie. Treat it like you would going into any other movie you hadn’t watched before and you will thoroughly enjoy it. Unfortunately, The Dark Knight eclipses its sequel, but not by a huge amount. With the highly anticipated finale of Batman about to be released (The Dark Knight Rises), there was a solid week of Batman related stuff playing on TV. I started watching The Dark Knight during dinner and when it went to commercials, I noticed that the scene-break they used said “The Dark Knight” and then it said “Heath Ledger” underneath. That got me thinking – the entire comic and persona of Batman are based on, well, Batman. It’s funny that of all the actors’ names, they chose the villain. Now, obviously, I know Heath Ledger’s performance in The Dark Knight was an incredible feat of acting that pulled the story and attentions of the audience so that they were centered on him. I just found it funny because that movie will forever be epitomised by the Joker. It’s like, when you think of The Dark Knight, the first thing you think of is the Joker. Amazing. So, what other texts have featured the villain stealing the show? Well, the first one that came to mind was Othello by William Shakespeare. Iago has been widely regarded as Shakespeare’s ultimate villain, and one of his few Machiavellian evils (many of his villains were misguided, such as King Lear and Hamlet – they thought they were doing good). The fact that I can compare these two, vastly different, texts says something about the nature of the antagonist’s role. Let me cut to the chase: I think humans naturally enjoy a good villain more than a good hero. This might sound a bit morbid and cynical (and if it doesn’t yet, I’ll impress that upon you later), but I’ll present my reasons in a second. First, I want to pay homage to these two wonderful villains. Before I start, I want to put a little informative foreword here about villains for my fellow writers. Although “Machiavellian” is a classification for antagonists, I believe a wider classification exists. There are three kinds of villains: the evil, the misguided and the chaotic. The evil villain is your cookie-cutter do-bad-things villain. He is predictable, evil and must be stopped. This was the classic antagonist, and is sometimes known as a needless evil. It was the most common form of antagonist a few decades ago and was characterised by a lack of motive and/or simply being evil for the sake of evil. Being evil for money and power are included in this – what we have here is a character that is evil to the core with no evidence of a wider range of emotions because the character’s sole purpose for being created was to be the villain. Examples include the Wicked Witch of the West from, most Disney villains (such as Hades being evil when in true Greek Mythology, he was not), most villains of movies with aliens in them, and most serial killers or action movie villains where the motive is personal gain or psycopathic slaughter. You can tell that a more diverse opinion was never shown for these characters because they only wanted you to think of them as the bad guy that had to be killed. The misguided hero is the one who starts doing evil things out of the belief that they are acting in a “greater good”, are mislead or corrupted by a greater evil, or even just to avenge a horrible tragedy they experienced in their past. These are the heroes that you mourn for when they die, and the ones that you wish (and they sometimes are) could be converted back to the right path. Examples of these include Uchiha Itachi, Darth Vader, King Lear, and most other villains of any movie that tries to show an antagonist that repents at the end and delivers some sort of moral message. These villains are humanised more, and have more depth in character because they seem more real. To err is to be human, and it makes us wonder, how far would we go for the greater good and how far would we fall without even realising it? These villains are becoming more popular in contemporary media; I think writers have realised that a necessary evil is a bit unrealistic and shallow. Finally, we have the chaotic villain. It would be easier to describe this villain with an example than to explain it first, so I’ll just say the Joker (in The Dark Knight; I haven’t read enough Batman comics to understand his original character) is a chaotic villain. Alfred sums it up nicely with his famous quote (loosely quoted by me) “Because some men can’t be understood through logic, such as money. They can’t be bullied, controlled or negotiated with. 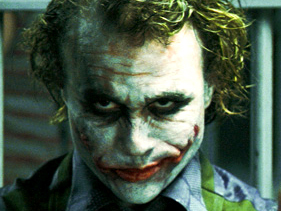 Some men just want to watch the world burn.” The Joker doesn’t want money. He burns a whole bunch of it to show the mob leader that money is petty. As he says himself “I don’t have plans. I just go with the flow”. He’s such a deliciously evil character because he cannot be predicted, and thus cannot easily be stopped. He’s not powerful because he’s super wealthy or is the leader of a powerful group, he’s powerful because he cannot be understood and because he seems to enjoy going to extremes that a normal human would shudder to think of. A chaotic villain is not necessarily evil – evil is predictable, you can always expect them to do the wrong thing. A chaotic villain simply does things. Sometimes they have unintended consequences – such as the Joker essentially putting the mob out of the picture as a crime force, uniting Gotham and solidifying Batman’s power – which may even be considered good, but in the end you know that something is going to be destroyed because that’s what chaos is. It’s not rational, not logical, follows no process and is not predictable. It just destroys. Now for the Joker. Let’s be clear, I’m talking about the Joker from The Dark Knight – I don’t want comic book fans attacking me, I admit I don’t know much about the original Joker. I’ve actually touched on some of this above in the chaotic villain explanation, but I just wanted to go a little bit deeper into the Joker’s character. I think he’s deliciously evil (or chaotic, if you go by my definitions) because if nothing else, he is an excellent study of the human pysche. I classified him earlier as Machiavellian because Machiavellianism is characterised by deceit and manipulation, two tools that the Joker uses to great effect. He enters the movie appearing like an intricate planner: he plays upon human greed by making his bank-robbing accomplices kill each other to reduce the split (more profits after splitting if there are less people to split it with). However, we know he’s not a planner – he says so himself. I see it more as his understanding of how humans will react, and using this to his advantage. He knows just how to get to people. Another powerful scene of him turning human instinct against itself is after he kills the black mob leader and says to the remaining three survivors “we have one position open, so let’s have tryouts”. He uses human survival instinct to turn former colleagues against each other in such a simple yet brutal way. There are so many more examples I could give, but the last one I’ll mention is how he even succeeded in turning every day citizens into potential murderers by threatening to blow up a hospital if that guy (forgot his name) who was going to expose Batman on TV was not killed within a certain amount of hours. By contrast, Iago is very similar, though due to the nature of the text in which he is a character and the sensibilities of Shakespeare’s audience, Othello is notably less in-your-face about the death and destruction. I would be wrong to say it was less violent though, as Iago manipulates Othello into killing his wife with his bare hands. As a character, Iago’s motive is never clearly given. He claims different motives to different characters but in the end, he only does so to manipulate them into doing what he wants them to do. The only thing we can possibly know about Iago is that he wants to destroy Othello, regardless of the consequences. This he succeeds in doing, all the while pretending to be Othello’s only trusted friend. His lack of clear motive and manipulative evil makes him one of Shakespeare’s greatest villains. Why do we love villains? Now to the question at hand. Let’s flash back to the beginning where I presented my thesis – humans naturally enjoy a good villain more than a good hero (good as in well designed; obviously I’m not talking about their ethical alignment). Why is this morbid? Because I think, deep down, humans have a penchant for evil. Objectively speaking, we do it every day without realising. Some evils have even become a social norm (such as discrimination) and others have even been endorsed by law (legal loopholes and other evils depending on the country you live in). Given the opportunity, many humans exhibit a strong desire to commit evil. These can be as lowly as stealing when nobody is looking to the abuse of power, such as prison guards humiliating and torturing prisoners (I’m sure I don’t need to give examples of these, they’re in the news every few months). However, I think the most powerful example of this that I can give is something my art professor told me once (I’m actually quite disappointed that I forgot the name of this case, so I can’t source this information). She said that there was an artist who made himself the exhibit and sat amidst an assortment of tools. He invited the audience to use these on him. There were thumbtacks, nails and things like that. At first, the audience did nothing; they thought he was joking. Then somebody hit him lightly. The artist didn’t move or complain. Slowly, the audience became more daring. They used the thumbtacks, they cut him and beat him, until finally, somebody reached for a gun (it was unloaded but they didn’t know that), at which point security stepped in to stop it. If anyone remembers the name of this, please let me know. If anyone thinks my professor was lying to me, maybe she was but I’ve heard of weird self-inflicted-pain artists and regardless, I think this would happen. Humans have a penchant for evil. We are restricted by laws and social paradigm, but, given a chance, we would revert to a primal, destructive creature. I’m sure some people will be too shocked at this accusation to give it any serious thought. Some will proclaim infallible ethical behaviour, or point to the statistically tiny amount of good people in the world. Truth is, most people are never in a situation where they can commit evil and get away with it. But if you look at humanity’s history of crimes, the destruction we’ve caused on both each other and everything around us, as well as our self-righteous thinking, as well as the way we treat fellow human beings, let alone other living creatures, I think you might come to realise that of all the living things we have discovered, humans are the most evil. Of course, we could get into a semantic debate over the word evil and how it’s subjective, but you should get my point. Humans are, by nature, more strongly affiliated with evil than good. You’re more likely to find people who would steal than give something of their own just to make somebody else better off. Selfishness runs through us right to the core, and is really the root of all evil. That’s another debate I’ll have another time. One more example: you’re more likely to find a person ignore a mugging than stop one. Before you argue with me over this one, let me tell you that I consider apathy and cowardice a trait of evil (as opposed to good). Of course, they have a different amount of severity to a higher evil, such as slaughter, but it’s still a part of evil. Evil is so much more powerful than good. It’s so much easier to be evil than good, and so much easier to commit evil than protect yourself against it. Anyway, this is getting off topic. How does this relate to a good villain? Well a good hero can only act within certain bounds. Being “good” restricts you in how you act, and humans are already very used to the idea of a hero. It’s not realistic and it’s not mind bending. But a villain? To explore the mind of somebody incredibly wicked gives us some sort of perverted pleasure. We can never allow ourselves to do what the villain does, so the villain becomes a conduit for us to explore darker creativities that exist within us. That’s why movies that make you question yourself are so powerful, because deep down, there are parts of us that we would never believe existed. That’s why a villain has so much more potential than a hero. “You have rules. The Joker? He has no rules. Nobody’s going to cross him for you.” A fitting quote. The villain has so much capacity as a character, and that’s why good villains continue to steal the show from heroes. We’re sick of heroes. They’re two dimensional, unrealistic and at best, flick our heartstrings a little so we go “aww”. Villains chill us, haunt us and make us question reality. That is so much more powerful. Before you leave this post feeling all depressed, I want to add that I am not declaring all humans evil. I say we have a penchant for evil, but that does not mean we act (or should act) evilly. If there is anything that could possibly separate us from animals it is our ability to ignore our instincts and act with rectitude. Everyone’s had a crazy thought in their head before. Choosing not to listen to it is what makes you human.